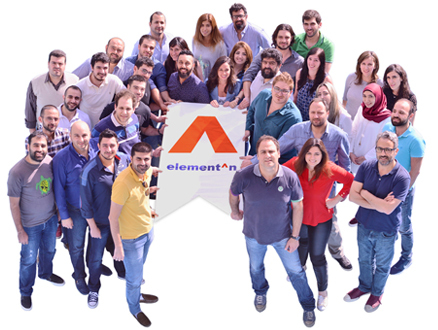 Founded in 2002, element^n is an innovative and ever growing internet technology and enterprise solutions company. We take pride in our team culture and shared values and thrive continuously to acquire and motivate the best talent. Apstrata™ – Our visionary Cloud Computing platform delivers on-demand, advanced webservices to empower Rich Client, Desktop, mobile and embedded applications providing unsurpassed time-to-market and cost effectiveness. Autoforms™ - A scalable, J2EE enterprise e-business suite that integrates Business Process Management, Digital Asset and Content Management. Tailored web application design and development, customizable web products, user experience and usability consulting, enterprise information architecture, Web 2.0 and portal solutions development. Regional and global including telecoms, banks, real estate and software companies. Flat and team driven, agile and cross functional, quick to adapt to changing trends and emerging technologies. Focus on positive working environment, flexible hours, work/life balance, continuous learning, and true empowerment. Knowledgeable, collaborative, friendly, professional, collegial, and fun! We are seeking top talent. A personalized career development path, ongoing internal skills development programs and one-on-one mentoring will keep it developing. If you think you’ve got what it takes to be a trend setter at element^n, you can apply here.